Safelincs has launched a new fold-out fire escape ladder for private and commercial use. 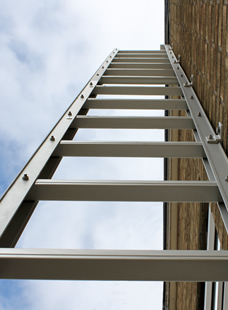 The Saffold escape ladder is fitted to the outside of a building and, when not in use, folds into a neat, drainpipe-like fixture. This appearance makes it unobtrusive to the eye, while unauthorised access is prevented with a pin situated at the top of the ladder, locking it in position. The ladder design is based on the successful Modum fire escape ladder with a number of improved or new features. All man-made fibre components have now been replaced with stainless steel and the rungs and extension handles have been re-designed, making them easier and safer to use. The same 15 year warranty applies and the new Saffold segments can be added to existing Modum installations. The Saffold ladder is supplied in modular segments, which can be connected to a maximum 10m in length. We are particularly pleased to manufacture the Saffold ladder in the UK, proving that quality and competitiveness are not mutually exclusive. The new fold-out ladder can also be used as an access ladder for flat roofs or engineering platforms. UNICEF, the United Nation’s advocate for children, is represented in 190 countries around the world. They carry out crucial work in eradicating child diseases such as Polio and are trying to stop female genital cutting in countries such as Senegal. Their international representations have of course to be protected against fire risk. This week we supplied a number of Modum fire escape ladders to UNICEF in Senegal to allow safe exit from buildings in an emergency. Wherever our customers are, we will meet even your most difficult shipping requirements and product requests. We have a dedicated member of staff to organise your international shipments and dangerous goods allowing us to meet your requirements quickly. Should you have any queries with regards to international shipments, please contact us and we will be happy to help.